We have just finished our DIBELS, and yikes. 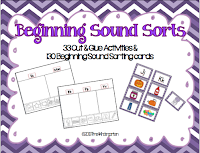 Very few of my kids know their letters and even less know what a beginning sound is. I have a lot of work to do this year. 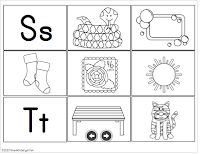 We are almost through with our letter of the day introduction then we will focus on our letter of the week. However, I have already started focussing on S,M, R, T & A. I need my kids to know these know and be SMART. What I have learned in the past 22 days with my kids is that they don't even have the vocabulary needed to produce initial sounds. When I show them a picture or an object, only a few kids even know what it is. So, for the past week, I have been working like a mad woman to recreate many of my sorting activities and beginning sound cards so that they all match. 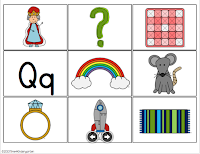 I need my kids to become familiar with the pictures in order for them to learn what they are called. Here is what we have been sorting. 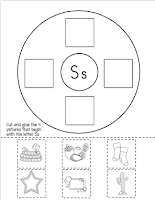 Each day we use the cards in a variety of ways- we make anchor charts using the black and white versions of the cards. However, if they were laminated I could tape on the colored versions. 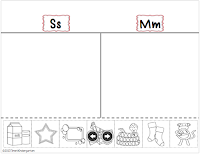 I used the fancy printed and laminated versions in the pocket charts for sorting. 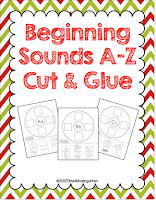 To reinforce what we have learned, I will be using my Beginning Sound Sorts and My Beginning Sounds A-Z Cut and Glue with my small groups. 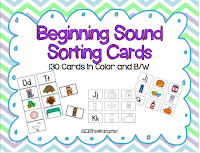 If you use Thinking Maps, my Beginning Sounds Sorting Cards might be a great addition to your teaching. A colored version is included with the Beginning Sound Sort Pack, but not the B/W. Make sure you visit my Facebook Fan Page to get a sample of each of these products.